What is “Comprehensive School Health”? Social and Physical Environment The social environment is the quality of the relationships among and between school staff and students, and the emotional well-being of students. For example, healthy schools have warm and caring relationships among students and staff, and do not tolerate bullying. The physical environment includes the buildings, grounds, play space, and equipment in and surrounding the school. For example, school facilities and activities are safe and accessible for everyone. Teaching and Learning Both formal instruction, and informal learning, such as having school staff model healthy behaviours for students. 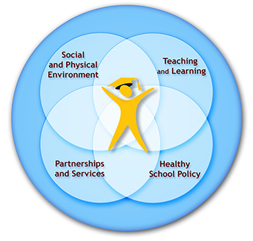 Healthy School Policy Management practices, decision-making processes, rules, procedures and policies at all levels that promote health and wellbeing and shape a respectful, welcoming and caring school environment. They can include everything from guidelines for physical activity and food sales, to rules regarding conduct, to frameworks for engaging community partners. Health and education are interdependent: healthy students are better learners, and better-educated individuals are healthier. Research has shown that CSH improves both health  and educational outcomes , as well as encourage healthy behaviours that last a lifetime. In the broader school environment, it helps students develop the skills they need to be physically and emotionally healthy for life. Collect data on how your students are getting to school. Our app, BikeWalkRoll, makes it easy to calculate this with simple 30-second classroom surveys. You can then compare your school’s score with schools across Manitoba. As a bonus, these surveys also help us monitor how transportation trends are changing over time. Create and adopt policies (see Write an Active School Travel Policy) that prioritize active school travel, which include updating transportation policy pages on school websites to include information on walking and cycling; anti-idling policies; signing Active School Travel Charters, etc. Create a school policy around traffic management. This could consist of “No Stopping” zones during drop-off and pick-up, along with designated areas for drop-off and pickup. Make the case as to why active transportation should be a priority at your school/division with this comprehensive report Saving Time and Money with Active School Travel. Our Active and Safe Routes to School program is here to partner with schools to provide resources, support, and services to school to help them improve rates of active school travel by making it easy, fun, safe, and accessible. Visit our program page for more information, or contact us by email at ASRTS[at]greenactioncentre.ca. Stewart-Brown, S. (2006). What is the evidence on school health promotion in improving health or preventing disease and, specifically, what is the effectiveness of the health promoting schools approach? Copenhagen, WHO Regional Office for Europe (Health Evidence Network report; http://www.euro.who.int/document/e88185.pdf, accessed 16 Sep. 2008). Murray, N.D., Low, B.J., Hollis, C., Cross, A. Davis, S. (2007). Coordinated school health programs and academic achievement: a systematic review of the literature. Journal of School Health, 77 (9), 589-599.